Board-and-batten is a vertical design created using wide clear or knotty cedar boards spaced apart with narrower boards (battens) covering the joins. There are no set board or batten widths - various combinations are used to create different looks suitable for large or small scale applications. Although for good appearance most builders strive for the widest boards and narrowest battens, the battens must be sufficiently wide to adequately overlap boards. For nominal 6" boards spaced 1/2" in. apart, battens should overlap by at least 1/2 in. With wider boards, increase batten overlap proportionately. While there are no set widths for board and batten siding, an attractive combination is 1x3 battens with 1x10 boards. Siding should be nailed to horizontal blocking lines or to furring strips. Rough sawn, unseasoned boards or boards surfaced on one side and two edges (S1S2E) are commonly used for board-and-batten siding. Sizes are from 1 x 2 in. to 1 x 12 in. Boards up to 6 in. wide should be fixed with one nail per bearing driven through the center of the board. 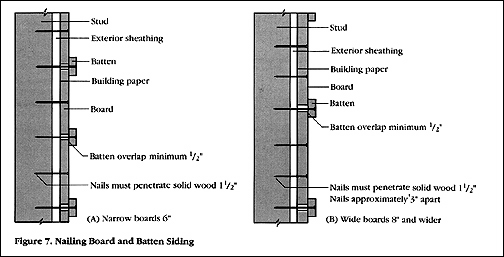 The overlying batten covering the gap between boards should be attached with one nail per bearing, the shank passing between the edges of the underboards. Use two nails per bearing on boards 8 in. and wider placing the nails approximately 3 in. apart (see Figure 7 above).